First of all, I should mention/warn that there has been a recent slowdown in my writing, which will probably increase the spacing in my posts for a little while. I have been busy working on another computer program (see Delivergrid and Urban Blight) and when it is finished I will make it available as usual on this site. It isn't movie-related (again, as usual), but the topic (cryptography) has been of great recent interest for me. And now onto the review! 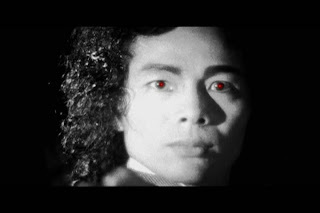 Over the years there have been many interesting interpretations and appropriations of the vampire mythology (see “Martin” (1978) for instance), but very few of them have been ballets. 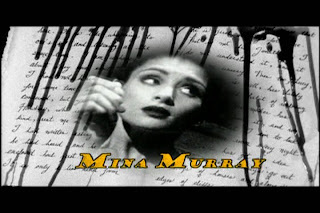 Canadian director Guy Maddin’s version is. Other films have updated Bram Stoker original tale for the modern day, Maddin’s 2002 “Dracula: Pages from a Virgin’s Diary” adapts the Royal Winnipeg Ballet’s version of the popular story for an audience of the past. Specifically, a silent era audience. After a credit sequence of faces superimposed onto antique frames, the film kicks off with a faux-alarmist series of intertitles lamenting the “invasion” of Britain from the East. “Immigrants! 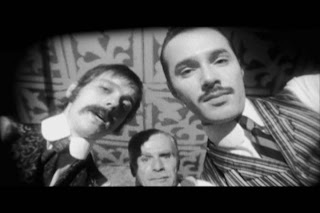 Others, from Other Lands!” With typical Maddin absurdity, his vampire tale masquerades as a metaphor for xenophobia, a sentiment not treated with much seriousness by the director, but granting the film an impression of subtextual hysteria. Lucy Westernra (subtle) is the first of Dracula’s victims. Her newfound reckless behavior manifests itself at a ballroom dance where she playfully rejects three suitors in favor of Renfield (an asylum patient who eats bugs) while swinging on a suspended chair. After biting her fiancé and collapsing from illness, Dr. Van Helsing is called in and you can guess his diagnosis. A long series of blood transfusions restores some rosiness to Lucy’s cheek, but a bed full of garlic can’t save her from that night’s invasion of gargoyles. Dracula is mistakenly invited into the home by Lucy’s dying mother (who then dies) and is reunited with his chosen midnight bride. The vampified Lucy goes on a baby-killing, man-seducing streak before Van Helsing catches on and leads a posse to free her soul from her animated corpse. Having staked his beautiful foe a few times over, Van Helsing determines to get to the real (other) heart of his troubles, by tracking down Dracula. Torturing Renfield proves fruitful, revealing that the next victim is Lucy’s friend Mina. She has recently set out for a convent where she hopes to nurse her fiancé, Jonathon Harker, the diary-writing virgin of the title. The two lovers get interrupted barely a dance number after their reunion by the caped Asiatic vampire. Van Helsing arrives and together with Harker he sets off to Dracula’s lair. Fans of Maddin’s work will already be quite familiar with the general style: black and white cinematography with low-key (high contrast) lighting, color tinting, irising, vignetting, expressive acting and intertitles. Everything you could want to recreate the look and feel of vintage silent era European cinema. The visual extremities are a mixed bag. While I liked the dyes and soft edges, it didn’t seem to have much consistency, meaning or added value. The CG enhancements range from pleasantly subtle (I love the gentle pink of Lucy’s cheek as she starts to revive, romantic but with a hint of the darker blood-tones more frequently shown) to painfully distracting (Dracula shoots his red cape at the scene for one transition). 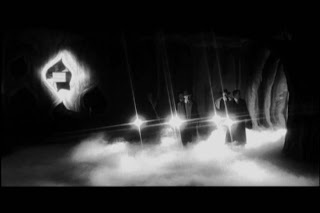 A scene involving computer-inserted snow lacked any sense of depth and ruined the atmosphere by having camera movement. Unfortunately, the snowflakes unnaturally parallel the camera and appear to move horizontally in perfect uniformity. Generally I think that the CG should have been avoided where it draws attention to itself, clashing with the otherwise olden techniques. Maddin brings his trademark idiosyncratic humor, overturning the cinematic conventions of yore with nods and winks at his audience. There are plenty of sly absurdist touches like the sign of the cross transformed into a dance move or a castle gate with loaded with overt sexual symbolism. The central gimmick around which the film revolves (beyond the antiquated style) is the ballet choreography set to Gustav Mahler. Viewers can either admire the ballet for its own sake or at least appreciate its unusual application. Standouts include a synchronized exorcism, pole-dancing gargoyles and a line of dancing men exploring a cave with choreographed flashlight movements. Though highly original, ambitious and well executed, one can’t help but feel that the ballet could have been so much more. None of the sequences stands out as a brilliant show-stopper and most suffer from a bit of a repetitive encirclement motif. Though the cast is comprised primarily of the original theatrical ballet performers, nothing particularly impressive or eye-catching happens in the choreography other than synchronization. At 75 minutes, the film is far from tedious, but more effort could have been done to innovate and vary the routines. Another problem is that Maddin’s style does not particularly compliment the dancing. His quick and choppy editing and virtuoso cinematography distract from the performances and reduce whatever expert choreography is going on into a sequence of blurred (courtesy of Vaseline applied to the lens), fogged, softly-focused, overshadowed, brief and jarring images. The clarity and grace of the dancing is often undermined unnecessarily. While other films, like his 2000 short “The Heart of the World” used the quick cutting to imitate/celebrate/lampoon Soviet Eisenstein techniques, the speed feels inappropriate here. In some sequences, like the one involving pole-dancing gargoyles, the full potential for visual humor or even artistic admiration was lost in the obscuring darkness and some important shots are even outright eclipsed by foreground material. So while the film easily sustains itself and provides no lack of stylish atmosphere cobbled from gothic literature, German Expressionism and Maddin’s lush imagination, it felt like it didn’t fully cash in on its premise and potential. The narrative is disjointedly divided into two halves, Lucy’s and Mina’s, with neither really rising above the oft-told story or seriously attempting deeper levels. The dancing is enjoyable, but not breath-taking. The visuals are arresting, yet not fully polished are well integrated. The dry humor and dense surrealism are probably the highlight, but they don’t live up to the Canadian’s masterpiece, “The Saddest Music in the World” (2003). 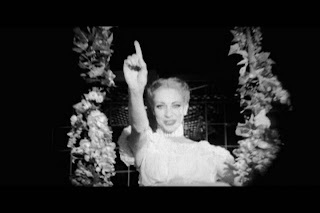 Fans of Maddin, ballet or vampires should definitely see this film. For others it will probably be more of an interesting artistic oddity (a fever dream according to the film) than an entertaining or enlightening experience. 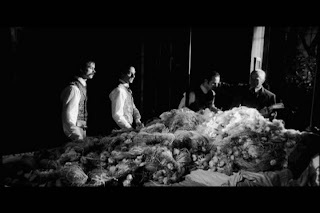 It gave me a much-needed dose of one of my favorite directors, almost enough to cure the sorrow at finding out Maddin’s latest work, “Brand Upon the Brain” (May 2007), will not be coming to any theaters in Kansas or Missouri. Actually, no. That was a typo. I meant "one of my favorites." It has now been corrected. I love Maddin; I think I was even the first person to screen his "Cowards Bend the Knee" publically in St Louis. Yet, his output is small and kind of uneven and not for every mood. Sounds like Maddin needs to call up those guys from SIGGRAPH who were so excited about their artificial rain streaks, and see if they can handle snow. 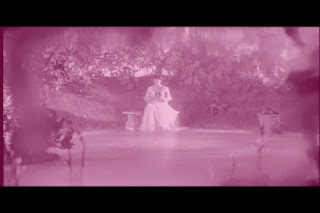 Do you know if the choreography was created specifically for this movie, or if Maddin was filming a pre-existing piece? It seems tough to tell about the choreography. 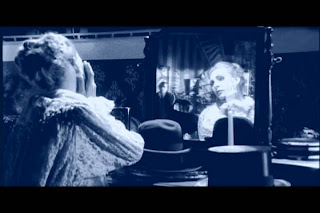 The peices were all set within single confined stages and were clearly designed to be viewed best from one particular side, but then again, there were aspects of Maddin strangeness that seem like he must have at least tweaked the routines. Good to here from you! I'll send an email soon.